With five top 10s in his 12 Masters appearences, Justin Rose has a stellar record at Augusta. In an exclusive interview with Golf World's Kit Alexander, he reveals his secrets for going low among the dogwoods. 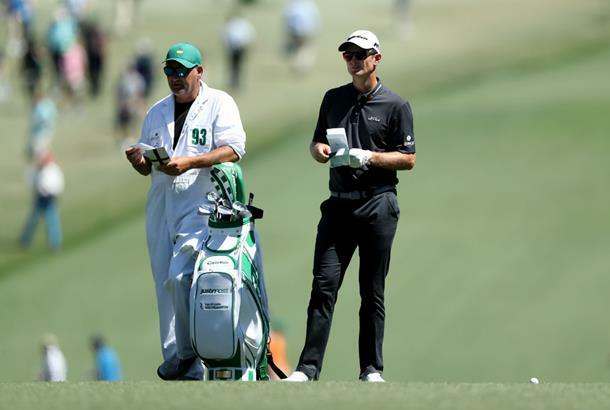 Justin Rose clearly has a strong affinity with Augusta National and the Masters. His face lights up as we discuss the first major of the year. His love for, and intimate knowledge of, one of the world's most famous golf courses is immediately obvious. He's animated as he recalls specific shots and describes the holes. And why wouldn't he love the place, given he has such a fantastic record there? Rose has played the Masters 12 times, dating back to his debut in 2003 – he's never finished worse than a T39th in that first appearance. Why do you play so well at Augusta National – what's the secret? I think the bottom line is that it's a special place, an awe-inspiring place and somewhere I like to be. The Masters is something I focus on and prepare for. It's not just one week, it's about three months of preparation. I go to Augusta before the tournament to play a couple of rounds before the Masters each year. People say 'you've played the tournament 12 times and probably played 80 rounds at Augusta, so why do you keep coming back?' I'm like 'Why not? It's Augusta!'. If you're in the Masters field and you get the opportunity to go and play a couple of rounds, then why wouldn't you? It's just that type of place. I've collected a lot of good data over the years and understand a lot of the pin placements. Augusta is about angles, really. Where you can and can't miss. The fairways are really wide there so putting yourself in position to have the best approach, knowing certain pins to respect and knowing the lines to hit to use the feeder slopes to pins is important. It's little things you pick up through the years. There are secrets, but at the end of the day, it's about execution. Even if you know the shot to hit at Augusta, if you don't hit it, you're in trouble. There's an accepted wisdom that you need experience to play well at Augusta. How true is that? Yeah, it's true. You've got to respect the golf course. It's a classic risk/reward layout in a lot of places and it sort of baits you, especially the back nine. It can bait you into making aggressive decisions that could pay off, or poor decisions that you can get punished on. You've got to have discipline to play that golf course. But as Sergio and I displayed last year, it's a fun golf course and that's what can happen on the back nine. There can be a lot of drama and a lot of opportunities. It's just a really fun course to play and if you hit the right shot at the right time, magic can happen. For example, the right shot into 7 can feed back to the hole. Same at 14. If you hit the right shot at 16 you can make a one. It starts with the Par 3 Tournament. They know where to put those pins so if you hit the right shot, off the right feeder slope, you can do something special. It creates drama that makes it so much fun. How has the layout and set-up changed over the years you've been going there? I've only ever played it with the Tiger- proofing. I'd have loved to have seen it all fairway, I think it would have looked fantastic. Obviously, the rough now is a factor. You don't want to be in the rough, but I don't think getting fliers out the rough has been an issue. The only place that may have changed is with the chipping and around the greens because the extreme spin you used to be able to get with the square grooves could help you get up-and-down to a super-tight pin. But when they start talking about a little bit of rough giving you fliers and you have to get the ball in play off the tee, I don't think hitting the fairways now has any more relevance than when the groove rule was changed. From the rough, the ball comes out soft rather than quick, so you don't want to be in it. The biggest change for me has been mowing the fairways back at you (from green to tee). One, you have to strike your irons well into the grain. Two, it makes the course play longer. What are the main focuses for you in your preparation? Diet, health and fitness are important for me. I suffer with allergies and I learned a few years ago that if I really focus on my diet and my nutrition, then that can make a massive change to how I feel during the week. If you're struggling with allergies, it's really hard to focus and play as well as you want. That's why the preparation starts months ahead of time. When I do focus on the discipline of feeling good and eating well, then a lot of other good things happen. What are the shots you need? I don't think you need to draw the ball around there. It's so much longer now that you don't have to hook it around corners on holes like 9 – that's a straight tee shot now. The 14th is long enough now where straight is good, too. Ten is probably the only hole where I hit something quite extreme (in terms of shape) off the tee. I don't like to take driver too tight to the tree line. I take a three-wood way right and bend it and hook it. I can't really think of any other tee shots where I need to hook it. The way I play, 13 is a high driver – I don't try to draw it and if I run out, I run out. Would it be harsh to say it's become less of a shot-maker's course because of that? It's a second shot golf course so shot- making is important. It's all about iron play – and that's shot-making. Hitting holds into pins, draws, using slopes and shot-making around the greens. You have to hit some really cool short-game shots around Augusta if you're going to do well. Just how tough are those greens? I think they're tougher because of slope, for sure. We play surfaces as quick as Augusta maybe two or three times a year, but we don't play them with as extreme slopes. They cut the pins on 2% or 2.5% slope and we play those type of pin placements a lot, but very close to the pins at Augusta you often have a very steep ridge so if you miss on the wrong side then you literally can't stop the ball down that ridge to the pin. The severity of some of the sideboards – as I call those ridges – is what we don't often see. How long did it take you to get comfortable playing and scoring well at Augusta? I think the very minute I walked into the clubhouse. My whole first experience there was magical and I've loved it ever since. I feel like I learn a nugget every year, so you never stop learning at Augusta. I think it's good to take a local caddie when you first play it. I've had six or seven different local caddies and they all have their story – something they really want to share with you. I remember going down there with Poulter once and he got a read from one of the caddies. The guy says it's a ball right, so Poults hits the putt and the ball breaks a bit more and misses low so he goes to the caddie, 'A ball right? What? A football!' It was such a brilliant line. What secrets about playing Augusta well can you share with us? We've learnt where we can be aggressive a bit more over the years. The 3rd, for example. We used to lay back a lot and make a lot of fives. It's a really hard shot even with a 9-iron in there and it's semi- blind, so that's a hole that I challenge more than I used to thanks to trial and error. Just knowing some pins that you can really be aggressive at because the bunker isn't too bad. The one most players would know is the 4th hole. You can really challenge that front edge when the pin is only four or five paces over that bunker because if you hit it in the sand you can play it up off the backboard and it comes down close, but if you pitch it too far into the green with your approach then it tracks left and you've got a really tough putt. FOOCH'S VIEW: Rose's caddie Mark Fulcher on how he preps for Masters week. I've been very fortunate in that I've only ever worked for Justin at Augusta – and he has an intimate knowledge of the golf course. He's taught me and we've learned together its nuances. It's important to embrace it and love it, which we do. Monday is my most exciting day of the week. I'll walk to the course on my own. Now, a lot of the lads will ask if they can join me but it's the one day of the year when I actually say, 'Sorry, guys, this is my day'. It was a huge event for me when I was a kid, as it was for everybody. I like to enjoy the experience and get my mind in the right place. We have detailed yardage books and we learn something new every year. I feel like I could give them to anybody and it would help them challenge the week correctly. For me, it's about refreshing my memory of the course and pin positions, and remembering the experiences we've had. The only thing I try to avoid is making the same misjudgements we've made before. You're going to make errors – it's that sort of course and it's that sort of week – but if you learn from it and do your best not to let it happen again, then you're going to be ahead of the game. One of the hardest things is that you make half a mistake and lose half a shot, and then you feel tempted to press. But you just can't press at Augusta. People talk about the back nine opportunities – and they are there – but they will only come if you're consistent in your play. If you press, you'll certainly see people make eagles and birdies, but you might not see the guys who pressed and made double bogey."